As you can tell, we didn’t know if it was going to be a boy or a girl at that time! According to the latest ultrasound from a few weeks ago, there is a 90-95% chance that it’s a girl!!! Since my only daughter is in heaven and I have 3 grown sons, a granddaughter is exactly what I was hoping to get (of course, it’s my son and daughter-in-law’s baby, but I’ll be one of her 2 grandmothers)! 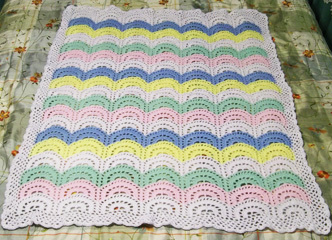 The top blanket in pastels is the one that I finished for my mom after she passed away in February. It was a “labor of love” to finish it for her. 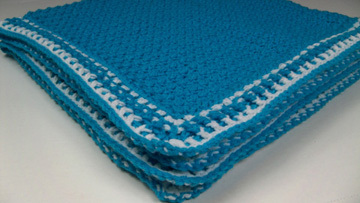 You can read all about this blanket in my previous blog post here. The bottom blanket is the turquoise blanket that I designed last year before I knew if it was going to be a boy or a girl. I think turquoise can be used for either one and it’s one of my daughter-in-law’s favorite colors! I used almost a full skein of Lion Brand Pound of Love yarn, which has 1,020 yards in it! The contrasting white sections in the edging didn’t take much yarn, though. 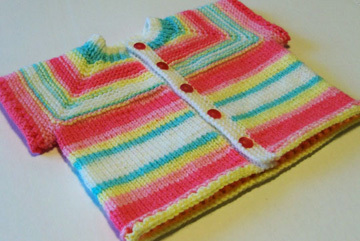 The top sweater is knit with half of a skein of Lion Brand Ice Cream in color #206 Tutti Frutti. I really enjoyed knitting this sweater because of the colors of the yarn! And I have enough yarn left over for another sweater or possibly matching booties! The bottom sweater is knit with half of a skein of Moda Dea Tweedle Dee that I had leftover from years ago (I don’t think this yarn is made any more, though). It’s a bulky yarn and this sweater knits up in just 2-3 hours (from the top down)! It’s a really quick project and I like the final sweater. My youngest son went to China in February and took this sweater, along with a couple of other baby items that I made, to my middle son and daughter-in-law for me. My daughter-in-law said that this sweater reminds her of ewoks from Star Wars! It doesn’t look like what the ewoks wore in the movie, but the colors do kind of look like ewok colors. 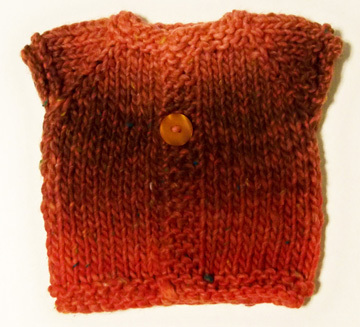 If you’re a knitter and you’d like to knit one of these quick baby sweaters, you can find the free pattern on Ravelry here. It’s called “Wee Speedy”. 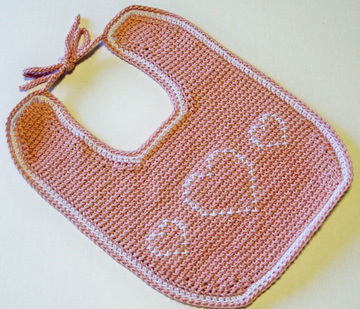 This is a Tunisian baby bib. If you’ve never tried Tunisian crochet before, you should check it out! It’s a lot of fun! 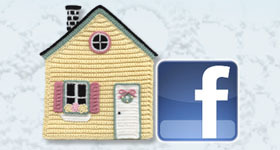 I find it rhythmic to do and the resulting texture lends itself very well to cross stitching on top of it! 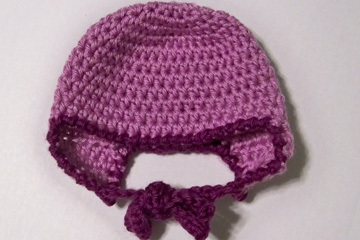 This diaper cover and baby hat were from the book, “Baby Brights” by Kathleen McCafferty. You can see that book on Amazon here. 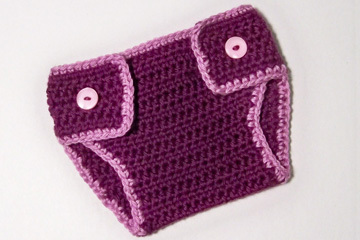 I have no idea how well this diaper cover will work, but my son and daughter-in-law are planning to use cloth diapers, so I may be making more of these, if they work out well for them. 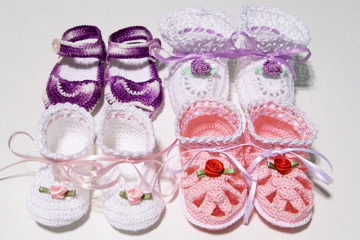 I hope you’ve enjoyed this look at the things I’ve made (so far) for my granddaughter. Of course, I’ll share photos of her after she arrives (which will be in China because my son and daughter-in-law are living there and attending a Chinese university to learn Chinese/Mandarin). I’m planning to fly over there for the birth of my first grandchild, God willing! 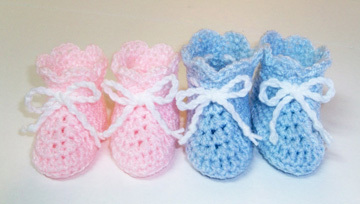 So until then, you’ll probably find me knitting and/or crocheting more things for our little “bundle of joy”!!! Yippee!!!!! 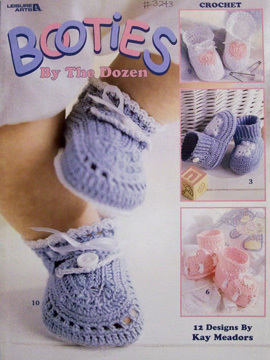 This entry was posted in Crochet designs, Crochet for baby, crochet projects and tagged Baby crochet, crochet patterns, crochet projects. Bookmark the permalink. 2 Responses to Crocheting for My Grandchild! The newest sandals and booties are adorable! She will be the best dressed girl. Thank you, Holly! I hope everything fits her at the right time of year!